Thre truly is no way to defend texting and driving. No way. It’s even becoming illegal in more and more states to even have a phone in your hand. Again, no way to defend it, but if I didn’t at least give these two thoughts I would regret it. The first is that people drive with other distractions too. From the kid in the carseat who drops his milk and the mom reaching around behind her to find it so he will stop crying, to changing the radio station. Much of this depends on a person’s ability to handle “multi-tasking.” Some people can, some people can’t. But my second point is less of a rebuttal to your blog and more of a plea. I don’t want to text while I drive, I do it for the connection. I would rather talk to someone on the phone, or better yet, in the car! I would rather hear a voice in my ear with laughter instead of empty “ha ha’s” but texting is how we do it now. It’s how we avoid connection with each other…while still “connecting.” And I don’t know about you, but I will take what I can get. Your blog, the video, and common sense all tell me texting while driving is a bad idea. I can agree and commit even to not doing it. But honestly, when it comes down to it, if that’s the only connection I can get from the people in my life, it’s hard to pass it up. I text mostly, but have learned that it is too tempting in the car. So, I just put my phone on silent while I am driving, that way I don’t know that I have messages until I get where I am going. That way I remove the temptation. 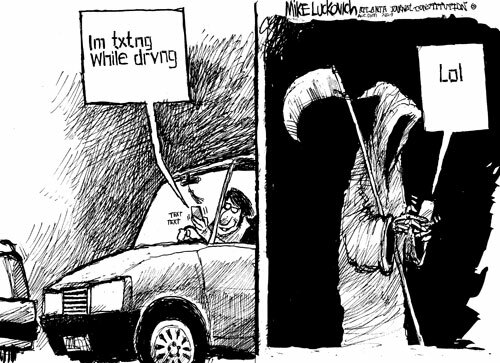 Texting and driving is too dangerous to mess with!!! Wish more people would learn this!